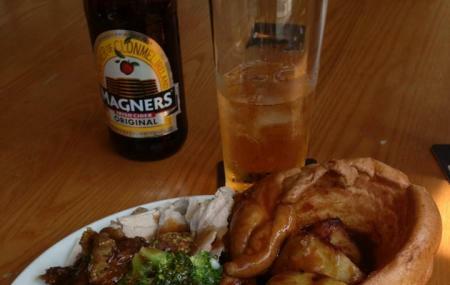 To surprise your taste buds with unforgettable British platters you can plan a visit to the Toby Carvery Kings Norton. It is a British restaurant that proudly serves the original tastes of Britain keeping the best quality maintained. The bistro is known for serving best in class breakfast items. But its other menus are also commendable. Chicken Wings, Garlic Home-Baked Bread, Roast Turkey, Salmon En Papillote are some of the items of this bistro which you can gorge on along with top class wine and other beverages of high-quality. Toby Carvery Kings Norton is famous for serving delicious desserts and special children’s menu as well. You can surely have a good time here spending affordably. Make your visit suitable to your interest, use Birmingham trip planner for personalization. Oomph up your visit by adding the best hotels in Birmingham like Holiday Inn Express Birmingham-snow Hill, Holiday Inn Birmingham City and Ibis Birmingham Centre New Street Station Hotel. All you can eat Breakfast buffet. What it says on the tin. Staff attentive and excellent. Food was ok though but I can appreciate that buffet breakfast isn't easy. Would have no hesitation visiting again. When the chief carved the meat, there was all the dried up bits and pieces of meat left in the hot plate when he carved. Needed cleaning down. The veg was dried up or floating in grease. Gravy station was dirty needed cleaning. The whole carvery area needed a good clean. I visited about 6.40 on a Wednesday not too busy. If staff would take more notice of making the carvery their priority instead of chatting it would be a much better experience. The excellent carvery is buffet style. Food was hot & well cooked. Staff are friendly & efficient & prices reasonable. Although the restaurant was busy(being half-term at approximately 2pm) we were seated quickly & our choice of drinks provided before we went to the buffet. The chef carves your choice of meat from Pork, Turkey, Gammon & Beef & we helped ourselves to an excellent selection of vegetables, gravy & sauces. It was a very enjoyable meal in pleasant surroundings. The big car park is easy to navigate with entry at the bottom & exit at the top, leading to the dual carriageway which is Pershore Road. There are notices in the car park explaining that as you go into the restaurant you must enter your car's number on the screen provided, which gives you free parking while you have your meal. I would recommend this restaurant. I had a good time, it was one of the best carverys I've had in a while. Staff were over run and massively short staff but young lady who served me was great polite and needs a raise. Going back next week and booked my table this time.